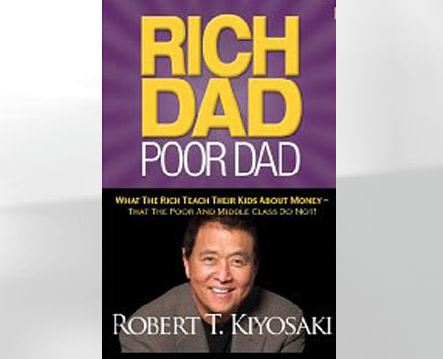 I finally got around to reading the famous Robert Kiyosaki book: “Rich Dad, Poor Dad“. At first read this seems a little selfish but what Kiyosaki is talking about is paying yourself first before your mortgage, your bills, your debts etc. BECAUSE… that will give you the mindset to think more creatively about money so that you CAN pay everyone else. He doesn’t advocate not paying people – just make sure it’s YOU first. When investing in an asset Kiyosaki advises looking to get your initial investment back as soon as possible so the only amount left at risk was any equity or growth that asset achieved in the meantime. That way what’s left IN the deal is actually free money. Pay for the luxuries in your life out of money earned passively by your assets. EG: Let the rental income from any property you own (for example) pay for your holiday or car payments. You should never buy luxuries with earned money, because any excess ‘earned‘ money should be put into buying assets that create positive cashflow. Identify who your heroes are and why. Then learn as much as you can about them and what they did to become the people you admire so much. Copy their process if you want to be like them, there’s no need to reinvent the wheel. Sounds counter-intuitive right? What Kiyosaki means is: identify what it is you want the most and learn to ‘give‘ that to others. What you want then finds it’s way back to you. You want more people to smile at you – smile at more people. In order to start a fire you must first give away a flame. And he doesn’t mean study how to teach, he means continue to learn all your life and then share (teach) what you learn with others. Only by teaching something do we get the deepest understanding of it. Most people work for money but if you want to be truly wealthy get money to work for you. Unfortunately the education system doesn’t teach that, so you have to find your own teachers and learn from them. The good thing is… they’re everywhere, in plain site. That’s my top 7 take aways from “Rich Dad, Poor Dad” – no substitute for reading the book yourself which I urge you to no matter where you are in your life. It’s never too late to become wealthy. Hope that helped – share with others if you think it did and keep an eye out for further book summaries. PS: If you’d like a free pdf copy of my book: “Do You Hate Your Job?” just email me and I’ll send it right over.